Mr. Quigley is a retired partner and CEO Emeritus of Deloitte. 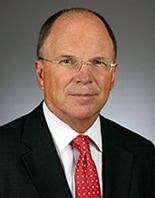 Prior to retiring in June 2012, Mr. Quigley served as chief executive officer of Deloitte Touche Tohmatsu Limited (DTTL, the Deloitte global network), from 2007 to 2011, and as chief executive officer of Deloitte LLP, the U.S. member firm of DTTL, from 2003 until 2007. He served as a trustee of the International Financial Reporting Standards Foundation from 2012 until December 2017. Mr. Quigley also is chairman of the board of directors of Hess Corporation and a member of the board of directors of Merrimack Pharmaceuticals, Inc. He previously was co-chairman of the TransAtlantic Business Dialogue, a member of the board of trustees of The German Marshall Fund of the United States, a director of the Center for Audit Quality, a trustee of the Financial Accounting Foundation, a member of the U.S. Securities and Exchange Commission Advisory Committee on Improvements to Financial Reporting, and a member of numerous committees of the American Institute of Certified Public Accountants. Mr. Quigley earned a Bachelor of Science degree and an honorary Doctorates of Business from Utah State University and Bentley College.